Browse through our photo galleries of in progress and completed building services by clicking the links or images below. We love helping you achieve your dream home and there is no better home improvement project in giving you extra living space than adding an extension to your property. Every porch that we design and build for your home will be unique and will enhance your living space and the look of your property. 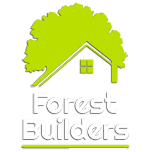 Forest Builders can build you a bespoke conservatory designed to your exact requirements. When having an extension, a conservatory or any building work carried out, the groundwork and foundations need to be considered carefully. A new patio area can be laid along with new turf or artificial grass. Water features, brick walls or maybe a raised area can be added to the design. An empty loft that you no longer use to store your belongings in and has been empty for some time can become useful space with a loft conversion. If you have two rooms within your property that do not serve a great purpose then why not consider having an internal wall removed. We offer professional level floor screeding solutions to our domestic and commerical customers throughout London and Essex.